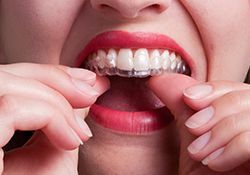 Patients who are interested in correcting misaligned teeth or noticeable gaps always have traditional braces at their disposal – but many shy away from this option, unwilling to sacrifice their natural, polished appearance for multiple years of obvious wires and brackets. Thankfully, an alternative is available at Dentistry by Design. With Invisalign, patients can leave the “mouthful of metal” behind and enjoy a sophisticated, subtle treatment experience instead, all while creating valuable, long-lasting improvements for their smile and self-confidence. Please don’t hesitate to contact our Bartlesville, OK location today if you’re interested in undergoing a consultation with Dr. Luke Lumpkin! Our team looks forward to welcoming you. Instead of traditional metal wires and silver brackets, Invisalign treatment takes a different approach to your orthodontic journey. 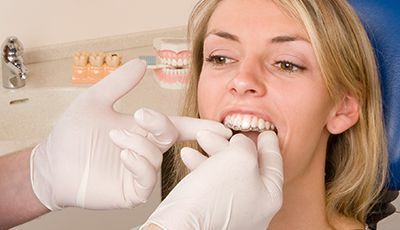 Our doctors will take detailed impressions of your smile and send them off to the Invisalign laboratory so that they can create a series of clear, plastic aligners. Each aligner represents a different stage of your teeth as they’re gradually moved towards the desired positioning. The patient’s responsibility is to wear each aligner for the recommended timespan (typically a few weeks) before switching to the next one in their provided set. They will also need to attend brief, routine appointments at Dentistry by Design so that progress can be gauged at appropriate intervals and any necessary adjustments can be made. In addition to being aesthetically pleasing, the Invisalign aligners are removable. This means that patients won’t have to make any inconvenient changes to their diet or oral hygiene routine at home throughout the course of treatment. If you have a big event coming up that you’d like to look your very best for, it’s even fine to remove the aligner(s) for an hour or two to enjoy yourself. In most cases, Invisalign treatment will be complete in 8-18 months.